Milla Wojciak, a 7-year-old girl from Breckenridge, was first runner-up at National American Miss Colorado state pageant May 25 in Colorado Springs. Milla Wojciak, 7, of Breckenridge was first runner-up at the National American Miss Colorado state pageant, May 25, in Colorado Springs. 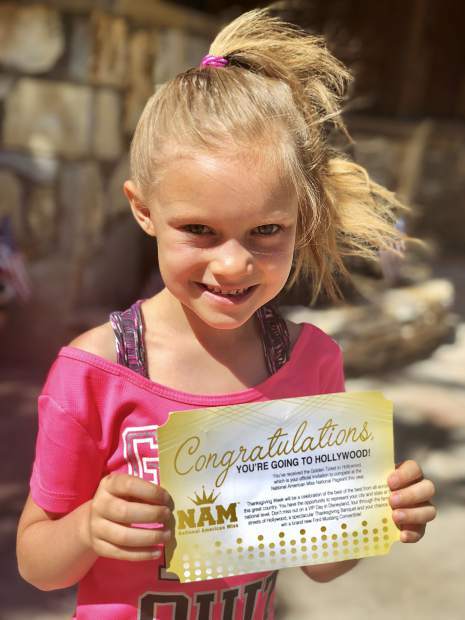 She placed in the princess division, and in doing so, qualified for a national competition in Hollywood, California, in November. Milla won other awards too, such as first in the talent show with a polka dance, and the spirit award for being kindest and most helpful to her peers. Milla is the daughter of Olga and Robert Wojciak.